Chuck Hagel served as the 24th Secretary of Defense from February 2013 to February 2015. During his tenure, he directed significant steps to modernize America’s partnerships and alliances, advance the rebalance in Asia-Pacific, bolster support for European allies, and enhance defense cooperation in the Middle East while overseeing the end of America’s combat mission in Afghanistan. In addition, he led major initiatives for service members and their families, including increasing resources for suicide prevention, combating sexual assault, and accounting for missing personnel. Further, Hagel improved partnerships with the Department of Veterans Affairs, to include health record interoperability, service treatment record transferability, and continuity of mental health services and support. Hagel launched the Defense Innovation Initiative to better prepare the Pentagon for future threats, and enacted comprehensive reforms to the nuclear enterprise and Military Health System. He is the only Vietnam veteran and the first enlisted combat veteran to serve as Secretary of Defense. Hagel served two terms in the U.S. Senate (1997-2009) representing the state of Nebraska. He was a senior member of the Senate Foreign Relations; Banking, Housing and Urban Affairs; and Intelligence committees. He chaired the Foreign Relations International Economic Policy, Export and Trade Promotion Subcommittee; and the Banking Committee’s International Trade and Finance and Securities subcommittees. Hagel also served as the chairman of the Congressional-Executive Commission on China and the Senate Climate Change Observer Group. Previously, Hagel was a distinguished professor at Georgetown University, co-chairman of the President’s Intelligence Advisory Board, chairman of the Atlantic Council, chairman of the United States of America Vietnam War Commemoration Advisory Committee, and co-chairman of the Vietnam Veterans Memorial Fund Corporate Council. He served as a member of the Secretary of Defense’s Policy Board, Secretary of Energy’s Blue Ribbon Commission on the Future of Nuclear Power, the Public Broadcasting Service (PBS) board of directors and Systemic Risk Council; as a senior advisor to Gallup; and on the Advisory Boards of Corsair Capital, Deutsche Bank America, M.I.C. Industries, Bread for the World, Bonnie J. Addario Lung Cancer Foundation, Center for the Study of the Presidency, Dwight D. Eisenhower Memorial Commission, George C. Marshall Foundation, Georgetown’s Institute for the Study of Diplomacy, Global Strategy Forum, Global Zero, Hamilton Project, Initiative for Global Development, Lung Cancer Alliance, International Center for the Study of Radicalization and Political Violence, National Bureau of Asian Research’s Next Generation Leadership Board, Ploughshares Fund, U.S. Global Leadership Coalition, U.S. Institute of Peace Middle East Senior Working Group, U.S. Middle East Project, America Abroad Media, American Security Project, and The Washington Center. Prior to his election to the U.S. Senate, Hagel was president of McCarthy & Company, an investment banking firm in Omaha, Nebraska. In the mid-1980s, Hagel co-founded VANGUARD Cellular Systems, Inc., a publicly traded corporation. He was president and CEO of the World USO, Private Sector Council (PSC), and chief operating officer of the 1990 Economic Summit of Industrialized Nations (G-7 Summit). Hagel also served as deputy administrator of the Veterans Administration under President Ronald Reagan and deputy commissioner general of the 1982 World’s Fair. The Pentagon: 75 Years: What was your most striking impression, or most striking first impression, of the Pentagon? 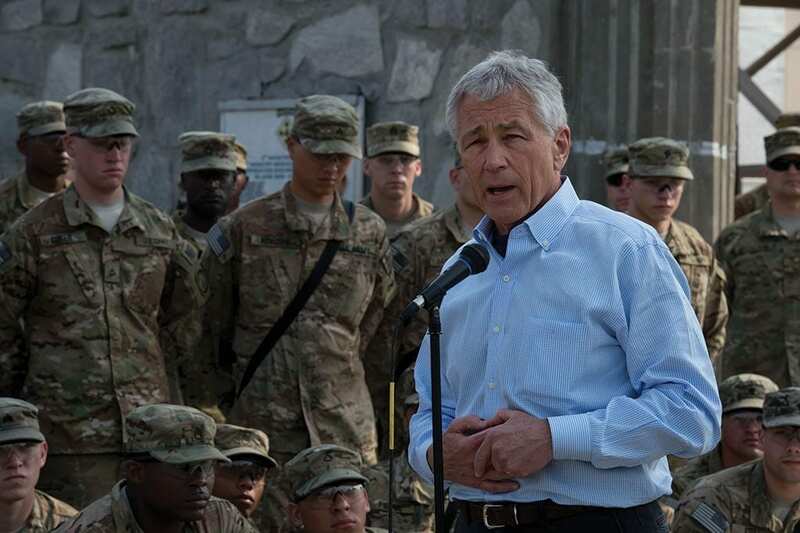 Secretary Chuck Hagel: The people. I’ve always believed any institution is only as good as its people. And the quality, commitment of the people that I saw that first day that I was at the Pentagon was pretty striking. I knew they were first-rate professionals and very good people and committed citizens. But until you really see them in action and see the sacrifices they make and how much they care about the country, you really don’t realize it. So, it was the people. It’s an iconic, historic, classical building that everyone in the world knows about. And it is such a magnificent structure that represents so much history and power of the United States that I think every leader who comes to the Pentagon for the first time is really awed by it. How do you think foreign dignitaries felt as far as when they saw the Pentagon, what their impressions were? I think every one of them was quite taken, especially those who came to the Pentagon for the first time. It’s an iconic, historic, classical building that everyone in the world knows about. And it is such a magnificent structure that represents so much history and power of the United States that I think every leader who comes to the Pentagon for the first time is really awed by it. I saw it as I entertained many, many heads of state and ministers of defense and foreign ministers and prime ministers, monarchs. And it was always the same reaction.